Dandelion to the rescue for your festive recovery! The humble Dandelion for festive time support! The humble Dandelion is abundant in the UK and beyond. Though now mostly seen as a “pesky weed” it has been respected as a healing plant for thousands of years. Referred to as the “flower of survival”, it is known for its hardy nature and remarkable ability to reproduce. Ever remember making a wish and blowing away the seeds? My Gran used to get me to “weed” it out of her garden. When learning about its powerful medicinal qualities at herb school, this became extremely difficult! Dandelion is fundamental in many herbal prescriptions. It opens the liver, stimulating secretion, aiding cleansing and encouraging it to restore itself. A necessity in our age of liver abuse! Excess alcohol, junk food, chemicals, drugs and stress hormones have our livers working flat out. Perhaps this is the reason it grows so abundantly in our world? At this time of year the Dandelions are deep in the ground, gearing up for a spring time explosion. Early spring is the optimum time for harvesting the root as they are at their most bitter. Like us, the plant uses up its sweetness over winter. The bitter taste stimulates digestive juices starting in the mouth, enhancing appetite and aiding absorption of nutrients. 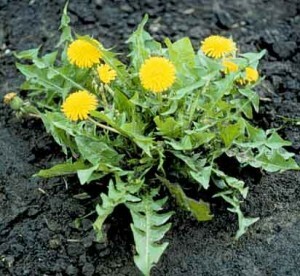 This bitter action makes Dandelion helpful for issues associated with a sluggish liver e.g. tiredness, irritability, headaches and skin problems. Skin problems can be an indication that the body is in need of help with internal cleansing. Dandelion can support this cleansing by increasing elimination of waste products through the liver and kidneys, preventing build up in the blood and therefore clearing the skin. Some skin problems can be a result of constipation where waste products are backed up in the system. As bile is a natural laxative Dandelion can be useful when constipation is due to sluggish digestion. Another common cause of constipation can be dehydration, where the body reabsorbs water wherever it can making stools dry and difficult to pass. Hydration with pure water supports the body in its daily cleanse and can prevent the effects of waste accumulation in the digestive system and skin. Spring cleaning with plenty of fresh water, lots of fresh fruit and vegetables and Dandelion medicine work wonders for promoting a regular bowel motion and clear skin. Strong bitter tastes are not always pleasant to experience. But in addition to Dandelion’s bitter taste and action, there is sweetness. Dandelion root is popular as a coffee substitute which can be found in shops. 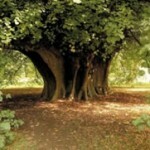 The root is also as an aid to cleanse the body and ease cravings. This may be helpful not only for caffeine addicts but for those with irregular blood sugar levels which create cravings for sugary junk food. Dandelion root is known to help regulate blood sugar levels for both hypoglycaemia and diabetes and is used for treating these conditions in herbal medicine prescriptions. Interestingly, strong cravings are a clue to what the body needs e.g. craving fried food after a big drinking session is the body’s way of stimulating bile flow and getting the liver working. Dandelion is an alternative to stimulating the liver without the need for junk food! The connection between the physical and emotional body is accepted in traditional medicine and is important to be aware of. The liver is often associated with heated emotions such as anger, frustration and aggression. This heat can be expressed through the skin and present as inflammations such as acne, boils and rashes. As with other herbs that work on the liver, Dandelion root is cooling and cleansing, therefore helping to relieve emotional stagnation and enhance expression of repressed emotions. It is therefore cleansing for both the physical and emotional bodies. The young leaves of the Dandelion are traditionally eaten in springtime for cleansing and detoxifying. The internal “spring cleaning” involves clearing out the heaviness of winter food and lifestyle and replacing with freshness and vitality. This kind of spring clean could include fasting and taking fresh herbs such as Nettle, Cleavers and Dandelion. Dandelion leaves have both cleansing and revitalising actions. They are highly nutritious and are commonly used in salads and spring time juices. Nutrients include: vitamin A, B1,B2, B6, C, D, E, K, calcium, iron, manganese, folate , magnesium and potassium which is three times as high as other plant tissues. The vitamins A content is even higher than carrots! Animals too enjoy a good Dandelion salad. As a child I remember gathering the leaves for my hamster’s favourite dinner. Even bears are partial to it and can be found munching away in a field of yellow flowers. Dandelion’s common name “pee the bed” originates from the leaves powerful diuretic action. This action makes it useful for treating water retention and high blood pressure due to excess fluid in the blood. Unlike conventional diuretics, which commonly deplete potassium through loss with increased urination, Dandelion leaves are naturally high in potassium and increase the net amount when taken as a medicine thereby avoiding potassium depletion. In addition to its diuretic action, it improves the elimination of uric acid and is useful for treating gout. Be aware that the milky latex from the leaves and stem is strong and can cause dermatitis. However, it is a traditional Scottish remedy for treating warts. Just be careful not to apply it to healthy skin if you are sensitive. For more serious conditions such as inflammation of the gall bladder and if there is an obstruction of the bile ducts it is important to refer to a medical professional. Root Decoction: 1tsp to each cup boiling water, simmer 15mins ½ to 1 cup freely (min 3 cups a day) Remember the fluid volume will reduce with boiling – therefore for one cup of medicine, boil up 2 cups of water with 2 teaspoon of dried herb. When harvesting your own be mindful of where it is growing. A plant from a fresh country meadow or protected vegetable patch is preferable to a dog-walking park by a main road or a garden where chemicals are sprayed. Perhaps you could even grow it in your own in your garden? The flowers are loved by pollinating insects and therefore helpful for organic gardens. As a member of the sunflower family it is a bright presence as well as a useful companion. Isn’t it amazing how helpful Dandelion is for our health and wellbeing. Knowing more about its usefulness I wonder if it looks different to you? This month’s herb is Calendula officinalis or pot marigold a member of the Asteraceae (sunflower or daisy) family. Culpeper called it “flower of the sun” and noted it under the influence of Leo (a bit like us right now!). Calendula officinalis is not the same genus as some of the other marigolds in the garden such as marsh, desert or corn marigold. Calendula officinalis is the marigold commonly used in herbal medicine today. There is research that discusses Calendula as a bacteriostatic rather than an antiseptic as it does not kill bacteria but instead contains them stopping the spread of infection. Its action on the lymphatic system supports keeping the wound clean and therefore aids the body to heal itself (Wood, 1997). I have seen it used many times in practice in tinture and dried herb mixes for its ability to help move the lymph. By aiding movement in the lymphatic system, it aids cleansing and thus provides increased immunity. In combination with other herbs (e.g. Galium aperine) it is an excellent remedy when there is congestion and swellings. Calendula is also a helpful “aunty” for the digestive system too. It’s anti-protozal and anti-inflammatory actions were shown to me a few years ago when my cat Bella was a kitten. She had diarrhoea for weeks and the different medicines from the vets unfortunately had no effect. I was lost as to what to do next. I then witnessed a remarkable moment whilst sitting with a cup of Calendula tea. Bella stopped for a moment in her little kitten world and started to smell the air, following the scent to my cup and started drinking my tea! She had found her medicine. I made her small amounts of tea and when cooled put it in a syringe to which she drank willingly (in contrast to having other medicine forced by syringe). She recovered quickly and now if ever she gets a knock or is not quite herself I make some Calendula tea (cooled first!) for her. The Calendula tea also helped me with the many scratches from having to clean her up in the middle of the night…kittens don’t like being washed when they are covered in poo! 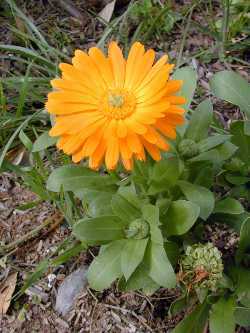 Often for skin inflammations from cat scratches to boils a compress of Calendula works wonders. I would make an infusion of the flowerheads (1-2 per cup of boiling water) and once cooled applied the flowerheads to the area and have the patient drink the water from the infusion. Above all this plant is a remedy for the skin. As well as stopping bleeding it is soothing, cooling and aides the inflammatory process. It is also known to evoke rapid epithelisation in damaged skin externally and internally. Definitely a handy aunty to have in the cupboard! The petals alone are often used and sometimes that is all that is available when purchasing the dried herb. I try and use the whole flower head when possible as I feel it holds the full medicine of Calendula. An infusion (or tea!) can be made using 1-2 teaspoonfuls of dried herb per cup of boiling water (up to 5 cups per day). If using the flowerheads I would use 2-3 flowerheads per teapot (makes 4 cups of tea). The infused oil can be made by filling a sterile jar with flower heads and covering with a good quality oil (preferably cold pressed and organic). I usually use sunflower oil. Make sure all the flower heads are covered in the oil to prevent it spoiling. Seal the jar and place in a sunny window for up to 3 weeks or until golden orange. Check the jar daily, shake and adjust to ensure the oil is still covering all the flower heads. When ready, drain the oil, store in a sterile bottle and label (include the date made). Calendula infused oil is excellent for massaging (especially in the winter time) and can also be added to creams for skin conditions. We will make this oil on the weekly herb class starting Wed August 10th (see workshop section). Calendula brings the golden sunshine even in the winter and for this reason has been used to treat those diagnosed with Seasonal Affected Disorder. It beams its light in places were the sun doesn’t shine. Of course there is much more to say on this treasure of a plant. I have included a list below for your interest and further reading. BARKER, J., 2001. The Medicinal Flora of Britain and Northwestern Europe. Kent: Winter Press. BARTRAM, T, 1998. Bartram’s Encyclopaedia of Medicinal Plants. Second Edition. London: Dorling Kindersley Ltd.
BUHNER, S. H., 2004. The Secret Teachings of Plants. Vermont: Bear & Co.
BUHNER, S. H., 2002. The Lost Language of Plants. Vermont: Chelsea Green Publishing. CHEVALLIER, A, 2001. Encyclopaedia of Medicinal Plants. Second Edition. London: Dorling Kindersley Ltd.
CULPEPER, N, 2002. Culpeper’s Colour Herbal. England: Foulsham & Co Ltd.
FRAWLEY, D, & LAD, V, 1992. The Yoga of Herbs. Second Edition. Twin Lakes USA: Lotus Press. GRIEVE, M, 1971. 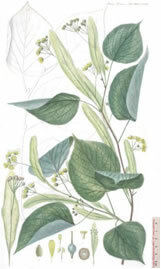 A Modern Herbal. New York: Dover Publications Inc.
HOFFMANN, D, 1990. The New Holistic Herbal. Great Britain: Penguin Books. HOLMES, P, 1997. The Energetics of Western Herbs. Colorado: Snow Lotus Inc Press. MABEY, R, 1988. The Complete New Herbal. Great Britain: Penguin Books. MCINTYRE, A, 2004. Herbal Treatment of Children. London: Elsevier & Co.
MCINTYRE, A, 1999. The Complete Woman‘s Herbal. London: Gaia. MILLS, S, 1985. The Dictionary of Modern Herbalism. UK: Thorsons Publishing Group. PRIEST, A.W., & PRIEST, L.R., 2005. Herbal Medications. Great Britain: Daniel & Co.
PENGELLY, A, 2004. The Constituents of Medical Plants. Second Edition. Oxon: CABI. ROGERS, C, 1997. The Women’s Guide to Herbal Medicine. Middlesex: Penguin Inc.
SKENDERI, G, 2003. Herbal Vade Mecum. New Jersey: Herbacy Press. TRICKEY, R, 1993. Women, Hormones & The Menstrual Cycle. Australia: Allen & Unwin. WOOD, M, 1997. The Book of Herbal Wisdom. California: North Atlantic Books.